This first section of my portfolio is dedicated to demonstrating that I am a member of the learning community. In fly fishing, there is a strong community of guides, anglers, and fisheries managers that are dedicated to promoting the sport and growing their own knowledge in the process. As a fly fishing guide, I am always striving to be the best guide that I can possibly be. To that end, I maintain a membership with the American Fly Fishing Trade Association. 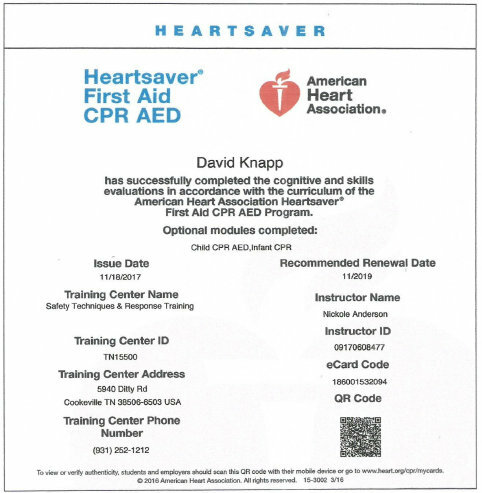 Additionally, I maintain current first aid and CPR certification as well as a guide license and a Commercial Use Authorization to provide services in the Great Smoky Mountains National Park. In the off season, I am also active in speaking at fly fishing club meetings throughout the area. Most of my speaking engagements are in Tennessee and Alabama. Finally, I stay connected with fisheries biologists at both the state and federal level. This allows a unique opportunity for information to flow both ways, providing useful data and anecdotal evidence to both parties. Specifically, I meet with Mark Thurman (who is the Head Fisheries Biologist for the Tennessee Wildlife Resource Agency Region III) several times a year to discuss the health of our fisheries and ongoing improvement efforts and suggestions. I also speak to the Head Fisheries Biologist and Assistant Fisheries Biologist in the Great Smoky Mountains National Park regularly to share useful information. I regularly write about fly fishing. Please visit my old fly fishing blog, the Trout Zone, as well as my guide site, Trout Zone Anglers to learn more. Please sign up for my newsletter via the Trout Zone Anglers website. Below are several artifacts documenting my participation in the fly fishing and fisheries communities. 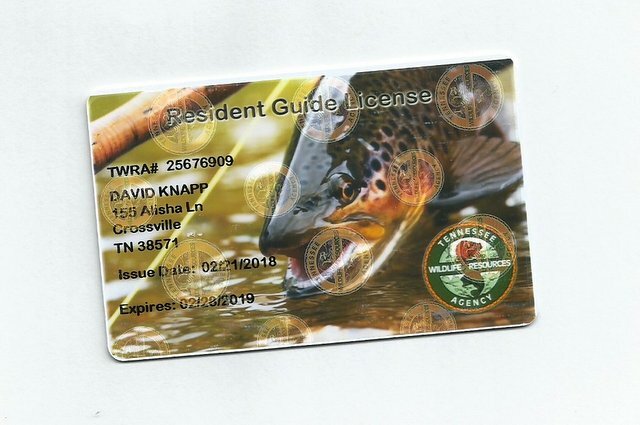 The link below will take you to a copy of my Commercial Use Authorization from the Great Smoky Mountains National Park. This allows me to provide services through my business within the boundaries of the National Park. 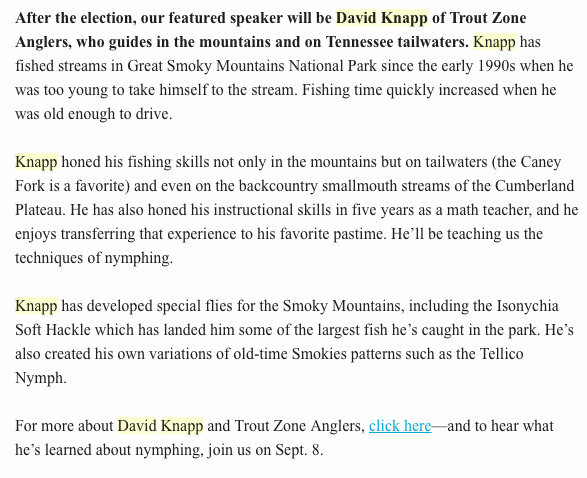 Below is an excerpt from a recent email exchange with the Great Smoky Mountains National Park fisheries biologists. Matt Kulp is the head fisheries biologist and Caleb Abramson is the assistant fisheries biologist. 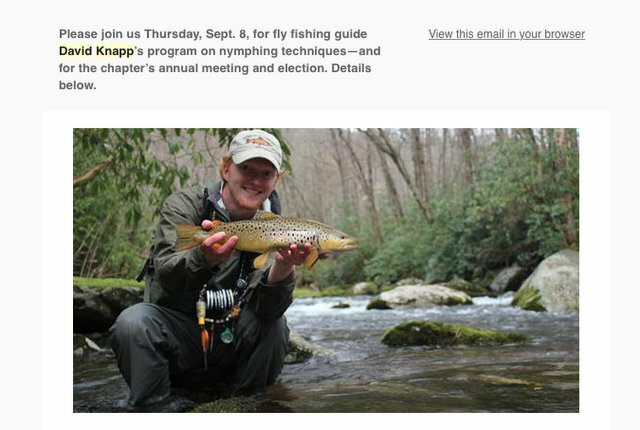 Finally, here is the announcement from one of the fly fishing club meetings that I have spoken at, the Clinch River Chapter of Trout Unlimited.